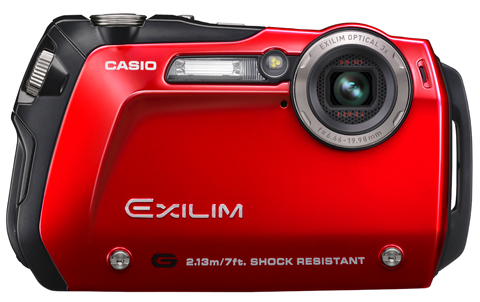 Casio has today announced that the Exilim G1 will be the first in a new series of digital cameras. Touted as shock-resistant, waterproof and dustproof the 12.1-million-pixel stainless steel-bodied EX-G1 will hit the high street next month in a choice of black or red. Boasting ‘rugged toughness’, Casio is positioning the G brand in the ‘endurance’ category, targeting ‘athletes and adventurers’. Features include a 2.5in screen and a lens designed to deliver the 35mm viewing angle equivalent of a 38-114mm zoom. It also includes interval shooting (for movies or stills) and multi-image capture. Casio claims that the G1’s shell can withstand a drop from a height of seven feet and the camera can be used at depths of 10 feet for 60 continuous minutes. The LCD panel is protected by an acrylic plate, to help prevent damage from water pressure and shocks. The Casio EX-G1 can shoot wide-screen (16:9 format) movies at a maximum resolution of 848×480 pixels, at 30 frames per second, according to Casio. The G1 will cost $299.99 in the United States. However, a power cut at Casio UK’s PR office has today delayed the release of information about the G1 to the press. At the time of writing we had yet to receive confirmation of a UK price or official specification.